Ardagh Girl Guides Spring Clean 2018. Spring Clean, Drumlish Tidy Towns 2018. Waste collected Drumlish Tidy Towns 2018. Spring Clean at Tomiskey, Newtownforbes. Clean up with trucks in Ballinamuck. 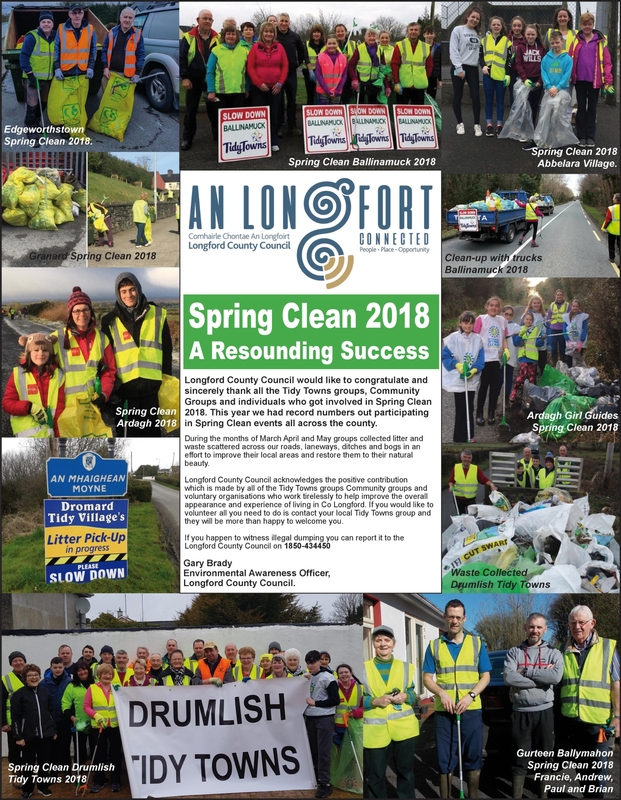 Longford County Council would like to congratulate and sincerely thank all the Tidy Towns groups, Community Groups and individuals who got involved in Spring Clean 2018. This year we had record numbers out participating in Spring Clean events all across the county. During the months of March April and May groups collected litter and waste scattered across our roads, laneways, ditches and bogs in an effort to improve their local areas and restore them to their natural beauty. Longford County Council acknowledges the positive contribution which is made by all of the Tidy Towns groups Community groups and voluntary organisations who work tirelessly to help improve the overall appearance and experience of living in Co Longford. If you would like to volunteer all you need to do is contact your local Tidy Towns group and they will be more than happy to welcome you. If you happen to witness illegal dumping you can report it to the Longford County Council on 1850-434450. - Gary Brady, Environmental Awareness Officer, Longford County Council.